Photo courtesy of USA TODAY Sports. 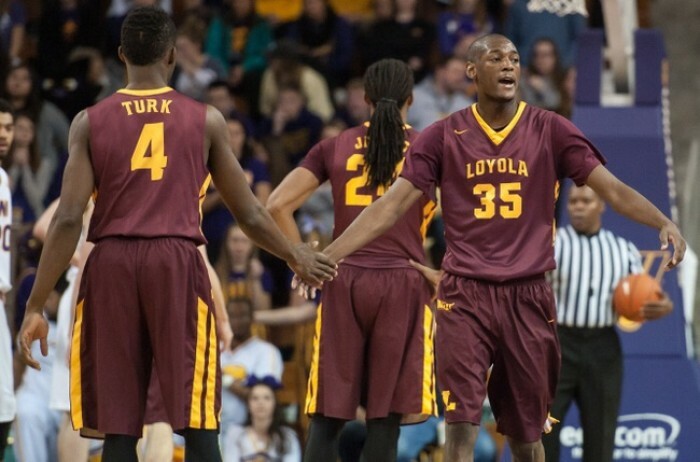 With two wins in their last three, the Loyola (IL) Ramblers are finally winning games they are suppose to win. Could they finally be climbing out of the bottom? Time will tell. CHICAGO, ILLINOIS---Seven games into Missouri Valley Conference play, the Drake Bulldogs and Loyola (IL) Ramblers had one win between them. In fact, the two were technically occupying the ninth and tenth spots in "The Valley" considering the Bradley Braves held the tie-breaker for eighth place over the Ramblers. So with each team's past struggles taken into consideration, this afternoon's battle inside the Joseph J. Gentile Center was more than just a conference game, but a contest that held great importance if either wanted to avoid a Thursday night opener when Arch Madness arrived this March. Because of six players scoring seven plus points, led by a game-high 17 from Montel James, and holding Drake's great backcourt tandem of Reed Timmer and Kale Abrahamson to 20 points, Loyola sneaked past the Bulldogs by the score of 68-63. Trading runs prior to the first media timeout, the Ramblers landed the first unanswered punch with a 10-3 spurt, starting with a pair of made jumpers from "jazzy junior" Milton Doyle and capped off with consecutive layups from Jeff "Ballout" White (16-8 LOY). Despite the first sizable advantage of the game being possessed by Loyola, Drake was able to dig and claw their way back by slowing down the pace and getting to the rim with layups. Actually, with what would be a 12-4 hunt by the Bulldogs, they tied the game at 20 with 4:18 left in the first half while taking the lead 65 seconds later with a triple from "swag freshman" Billy Wampler. Was Loyola about to let another team go into their house and upset them? On the ensuing possession, MD35, aka Milton Doyle, went up strong, was fouled, and made the basket. After making the free throw that followed, the Ramblers netted four more, prior to Drake supplying the last three, to go into the locker room up 29-26. However and unfortunately for LU, the last points put on the board by the Bulldogs had stolen momentum. Starting the second half with the aforementioned morale booster, Drake's Reed Timmer and Kale Abrahamson scored the first five points to take back the lead at 31-29. From there, the two cellular dwellers went back and forth, for neither had more than a five-point lead before the final horn sounded. Though, to be more specific, Loyola had the five-point edge heading into the final media timeout. Okay! So all the Ramblers had to do was take care of the basketball and make their free throws to walk out with the W? Simple enough, right? Less than a minute after the game resumed, back-to-back treys, one from each Kale Abrahamson and Graham Woodard, set up Drake with a one-point lead with 2:41 remaining. Yet, they couldn't hold the lead either, for Montel James went on a personal 5-0 run to make the score 64-60 in favor of the home team. Now the game was in hand, right? Although Loyola played fantastic defense on the next possession, Kale Abrahamson nailed another triple. 64-63 Loyola! In a must foul situation due to the shot clock being off, Drake fouled the Ramblers' Doyle. No stranger to making big shots in monumental moments, the team's leader made both attempts from the charity stripe, which forced the Bulldogs to make a three-pointer to tie. Rushing the ball up-court looking specifically for a triple, Drake went to sharpshooter Billy Wampler. Off the mark! But, Reed Timmer grabbed the rebound, backed the ball outside the arc, and fired an attempt for the tie. Clank! The ball fell harmlessly out of bounds with the possession going to the Ramblers. Once again the weight of the game was placed on the shoulders of Milton Doyle. The 6'4" hometown kid went to the charity stripe and made both free throws with seven tics left to ice the game. While it seems odd and unconventional to have a team's best two players coming off the bench, perhaps it is the formula that works best for the Loyola (IL) Ramblers. Joining superstar Milton Doyle as a contributor off the bench, Montel James broke out of his shooting slump from the past four games (7.5 PPG & 35.7% FG%) with a game-high 17 points on 5-of-8 shooting. A few contests earlier, Doyle, who was having trouble putting "the biscuit in the basket" to begin conference play (6 PPG & 30.7% FG%), emerged as the player fans know him as with 12 crucial points to lead Loyola past Northern Iowa for their first MVC win. This afternoon, MD35 chipped in 13 to keep his scoring average at 13 in his last three games. 9-11 (2-6) Loyola will go back on the road for their toughest test of the season against Wichita State on Wednesday. A team full of scoring and shooting guards, the Drake Bulldogs have yet to find enough points to grab their first win of conference play. But, with the emergence of Ore Arogundade, a victory will be sure to come in the future. After scoring zero points in three straight contests, Arogundade, a 6'3" sophomore, has been one of the hottest and more consistent Bulldogs as he has a total of 32 points in three games (including a game-high 12 today). On days which Timmer, Woodard, and Abrahamson cannot go off for 15 plus points, a player who is capable of driving the lane and hitting from outside, like Arogundade, is a welcomed asset. 5-15 (0-8) Drake will stay in the state of Illinois for a Tuesday night matchup at Illinois State.